LIC Jeevan Shanti plan is a single premium plan with dual option of returns that can be immediate or deferred annuity. It's a kind of pension plan where the benefit can be availed in many ways. It is completely non-linked, non-participating plan. People can be benefited in multiple ways with the aid of this plan. In both Immediate and deferred plans there are a lot of options to choose from. In the case of immediate annuity plans out of 9 options, 2 of them got option of life cover as well. In a deferred annuity plan, there are 2 options to buy, both covers the risks of life. In the case of immediate annuity plans, returns can be availed immediately. In deferred annuity plans, we can choose the time when we want the returns. This plan is launched to give people multiple options to choose from. They can decide to get their pension immediately or can defer it with returns. The plan is further bifurcated in many options. For an immediate annuity, there are around 9 different options to choose from. Deferred annuity got 2 major options to select from. All these options are customized keeping in mind the need of the policyholder. This is a good way of getting an assured amount at the time of retirement. Both Immediate and deferred got their features and benefits. The plan that we can choose from is based on our needs. Jeevan Shanti plan can be taken both online as well as offline. Jeevan Shanti offers two types of annuities Immediate and deferred with the one time premium payment. In the Immediate type of annuity, we can get the returns immediately after paying the premium. In the case of deferred annuity plan, we can get the returns only after some time period. Policy term can be decided by us in the case of deferred. The minimum term of the policy is one year, with a maximum term of around 20 years. Within immediate and deferred we have many options to choose from. All the different types of options are elaborated below. Option A - This is an immediate annuity plan in which the annuitant gets the returns immediately. He or she can enjoy these return for the lifetime. Payments can be received in convenient monthly, quarterly, bi-annual or annual returns. After the demise of the policyholder, annuity stops. Option B - According to this option, there's a guaranteed payment for the period of 5 years. Since it's an immediate annuity plan, payments start immediately. If during these 5 years annuitant expires than also the beneficiary can get the assured amount. In the case of his survival, the amount can be availed till his lifetime. 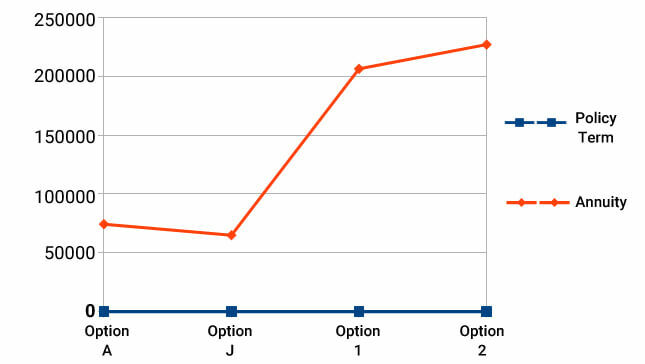 Option C - This option assures returns for the period of 10 years. If something happens to the policyholder during this period than his nominee gets the amount of pension. Option D - It's an immediate annuity with a guaranteed period of 15 years. After that period if policyholder survives than he can still avail the annuity amount till his lifetime. Option E - This option assured annuity for the period of 20 years. During this time if annuitant expires than his beneficiary can still get the amount as decided amount for 20 years. Option F - This is one of the immediate annuity plans in which the beneficiary can get the death benefits. In the case of demise of the policyholder, the nominee is entitled to get entire sum insured with the returns as applicable. Option G - In this kind of immediate annuity plan, there's 3% increase every year. Option H - It's kind of a joint annuity plan. At the time of the death of one policyholder, other person get 50% of pension amount till their survival. Option I - It is also a kind of joint annuity plan. As per this option, if something happens to one of the annuitants, another person can enjoy 100% benefits. Option J - In this joint life annuity plan If something happens to the annuitant, another person can get 100% annuity. They even get the cover at the time of the death of the policyholder. The amount that they are entitled to get is equivalent to the sum insured along with remaining returns if any. As per the deferred annuity plans, the policyholder can get the benefit after a certain time period only. In this type of plan, there are 2 options to choose from. Both of them has been explained below. Before the deferred term - In this option, only a single life is covered. At the time of the death of the policyholder before the deferred annuity period beneficiary gets the death benefits. After the deferred period - The annuity is given with returns as per the guarantee. In the case of the death of the policyholder, the beneficiary gets the death benefits ,annuity ceases immediately. Before the Deferred Term - During the period of deferred annuity plan, if one of the annuitant demises than other get the death benefits. After the deferred period - If one of the annuitants dies after the deferred perios than annuity ceases, other survivor gets the death benefits. This recent plan launched by LIC got multiple features. It can act as a great plan for someone looking out for assured Income. At the same time, it covers the life risk too in some options. Minimum Investment - LIC Jeevan Shanti starts with a minimum investment of Rs. 1,50,000, there is no limit on the maximum amount. Age criteria - Minimum age to take this plan is 30 years, maximum can be between 79 – 100 years. Premium Payment - Premium just need to be paid once as a lump sum amount. It can be started with the minimum payment of Rs. 1,50,000. There is no limit for the investment on the maximum amount. Maturity Terms - Maturity can be taken either as an immediate annuity or deferred payment. Immediate Annuity - If you choose this type of annuity than returns starts immediately after the payment of premium. There are lots of options to choose from within this plan as explained above. Deferred Annuity - Deferred annuity starts after the certain time period as decided by the policyholder. The minimum time period of deferred annuity starts from 1 year, the maximum period is 20 years. Loan Facility - The loan can be taken after the 1 year of the policy. In the case of immediate annuity this facility is available only in option F & J. For deferred annuity plan, it can be availed in both the options. Surrender Value - Policy can be surrendered after 3 months of purchase. In an immediate annuity, surrender option is available only in option f & j. In a deferred annuity plan, this option is available in both the plans. Free Lookup - Free lookup period of 15 days is granted. Within this time, the policy can be canceled. Special Coverage - In the case of handicap dependent, there is a special provision for reducing the minimum amount of investment. Death Benefits - The nominee can get the death benefit in option f & j of the immediate annuity. In the deferred annuity, death benefits are available in both the plans. Annuity payment flexibility - In any type of plans, an annuity can be paid in different intervals as per the convenience of the policyholder. It can be paid monthly, quarterly, bi-annually or annually. If someone buys a plan with a minimum investment of Rs. 1,50,000 than they can expect returns in monthly, quarterly, bi-annually, annually intervals as shown below. If someone who is 42 years old buys an annuity of 10,00,000, then his returns will differ based on the option he has chosen. It will further vary based on the option he selects. In this case payments in all the options will be different as shown below. How to Buy LIC Jeevan Shanti Plan Online? We can buy this plan through any channel online or offline. The online channel is the most preferred because of its ease and convenience. Easy and secure options for payments are also available online. After making the transaction online we can get the LIC policy within some time in our Inbox. It can be directly taken from the website of Life Insurance Corporation Of India as well. It's also prudential to check all their features on any of the comparison sites before choosing the plan. With the ease of buying this plan, it becomes all the more convenient to buy this plan. 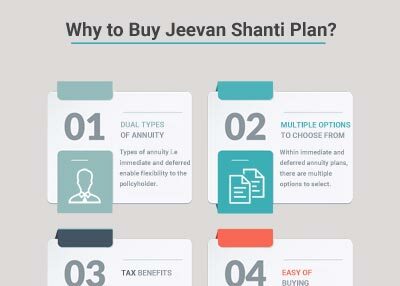 Why to Buy Jeevan Shanti Plan? Types of annuity i.e immediate and deferred enable flexibility to the policyholder. The annuitant can choose the plan as per their suitability. Within immediate and deferred annuity plans, there are multiple options to select. It has added further flexibility to the users. An immediate annuity has got 9 options, deferred got 2 options to choose. As per section 80 c and 80 d tax benefits can be availed from this plan. One time premium that is paid can be completely covered in the payment of tax. The best part of this plan is it can be purchased through online or offline mode. By investing in this plan there is surety of monthly income that policyholder can get. Period of Income is applicable for the lifetime. In some options, there's guarantee of Income even if the annuitant dies in between. It is completely based on the option that we have chosen. In case of the deferred plan there' surety of getting returns. These returns are added every month to the policy. After the deferred period, benefits can be availed. Immediate or Deferred Annuity, Which Type or Option to Choose From? Jeevan Shanti plan of LIC got 2 types of annuity that have got many options to choose. It may be a daunting task to select the suitable from so many options. With the small analogy, it may be easier to decide. Both types of annuity plan got its pros and cons. The suitable plan is based on our requirement completely. Shown below options from both immediate as well as deferred. You can do analysis based on your financial goals and needs and choose the options or type of annuity that is most suitable.